Step into a world of robots and zombies at StoneFire Pizza. 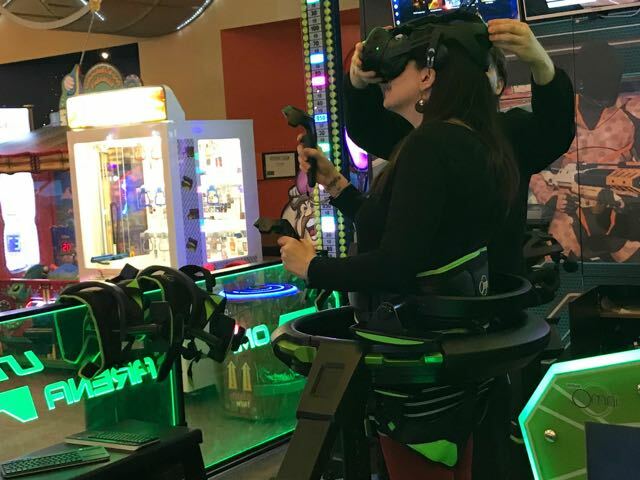 Published March 6, 2018 at 1:01 p.m.
Wisconsin's first Omni Virtual Reality opened in mid-January at StoneFire Pizza, 5320 S. Moorland Rd., and last week, we gave it a whirl. 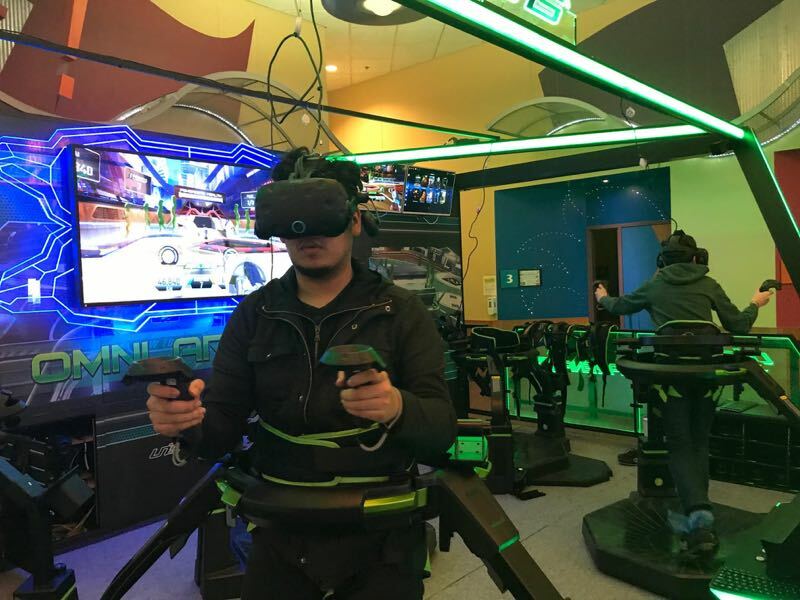 "This is different from other virtual reality experiences because it's completely immersive," explained general manager, Nick Lee. "Completely immersive" means the player looks and feels like they are inside the game and has to actually walk or run (in place) and move their arms around to shoot at, say, killer robots. In reality, the player is wearing headgear, a harness, special "sensor" shoes and holding controls. Not gonna lie: to observers, it looks ridiculous, like players are pew-pewing at the ceiling and randomly rotating in their harness, not even always facing the screen. But the active aspect of the Omni is part of its appeal, especially to parents. "Unlike a video game, you really are moving your arms and legs, running around, and getting some exercise," says Lee. The experience is a little unnerving at first and it takes a minute or two to acclimate. People who are claustrophobic, like myself, might feel a bit anxious at first but in my case it quickly subsided. Because I had robots to kill! Attendants did a solid job helping us dress for the experience and explaining how the game worked. All first timers play the same game which, according to Lee, is the easiest and most user friendly. After that, players can choose from a few different adventures from a shooting range to a zombie attack. "It's crazy. You really, really feel like you're in the 'world,'" says Lee. "It's awesome." I'd agree with that. Although I never lost touch with the fact I was playing a game, I definitely felt like I was in a world I'd never experienced before. The adventure lasts about 10 minutes and costs $9. Fridays are buy-one-get-one free. The Omni VR experience is available weekdays after 4 p.m. and all weekend long. Players have to be at least 48 inches tall and can play by themselves or against 1 or 3 other players. "Plus, we are introducing new games very soon!" says StoneFire manger, Karen Hubbard. As for my teen sons, who also tagged along, they've asked to go back every weekend. "It's super fun, no matter what age," says Lee.